Perfect for spot heating at home or office this Personal fan forced heater can deliver up to 5120 BTU and provide coverage up to 180 sq. 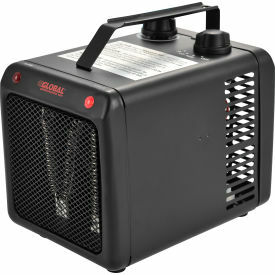 ft. Portable lightweight design makes it easy to use and carry around to needed locations for quick spot heating. Compact space-saving design makes it easy to store away. Durable steel construction and 6 ft. long power cord makes it great for facilities that need to bring supplemental heat to cold small working areas. This heater is equipped with a built-in thermal cut off switch a safety feature that will automatically turn the heater off if overheating occurs and turn alarm indicator light on to let user know. Easy to use built in turn dial thermostat can be set at desired comfort level plus an additional settings control knob lets you control heat output wattage or fan only operation. 4 Settings: Off, Fan Only, Lo (1000 Watts) and Hi (1500 Watts). Conserver energy by operating heater at lower wattage by turning control knob to 1000W position or set it at 1500W for maximum heat output.